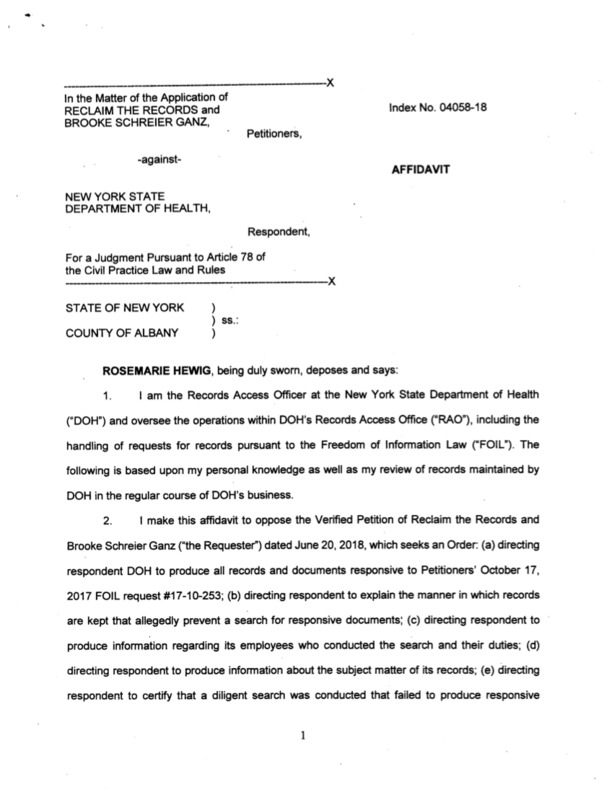 In the summer of 2018, Reclaim The Records launched a Freedom of Information lawsuit against the New York State Department of Health to find out why they treated our Freedom of Information request for the New York state death index so differently from how they treated the verbatim request from Ancestry.com, a large for-profit genealogy company. We discovered that Ancestry had filed a Freedom of Information Law (FOIL) request for the identical records more than a year after our own request — but received their copies of the records first. 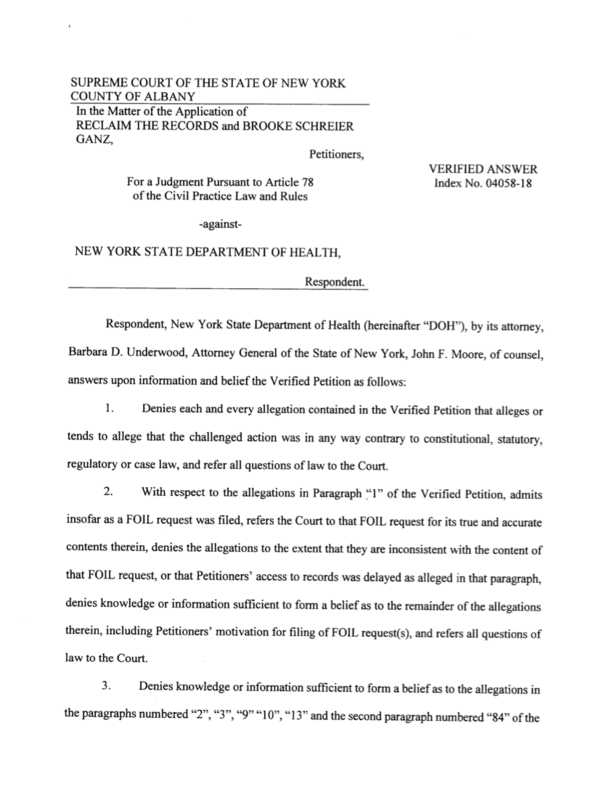 Furthermore, Ancestry did not appear to have been constrained by any of the same requirements the NYS DOH had given, in writing, to our request. These requirements included: the cost of digitization; a requirement for a 50% downpayment; the deadline when the downpayment and/or final payments would be required; the physical access to the original microfiche sheets; the inspection and sign-off of a state-hired archivist attesting to the adequate condition of the microfiche sheets; the sign-off of the state on the exact model of the microfiche scanner, its operational mode, and the hours and location where it could be used; and more. To add insult to injury, Ancestry apparently gained access to these public records using the exact words of Reclaim The Records’ 2016 FOIL request, cut-and-pasted into their FOIL request over a year later. And again, Ancestry still received access to the records first. 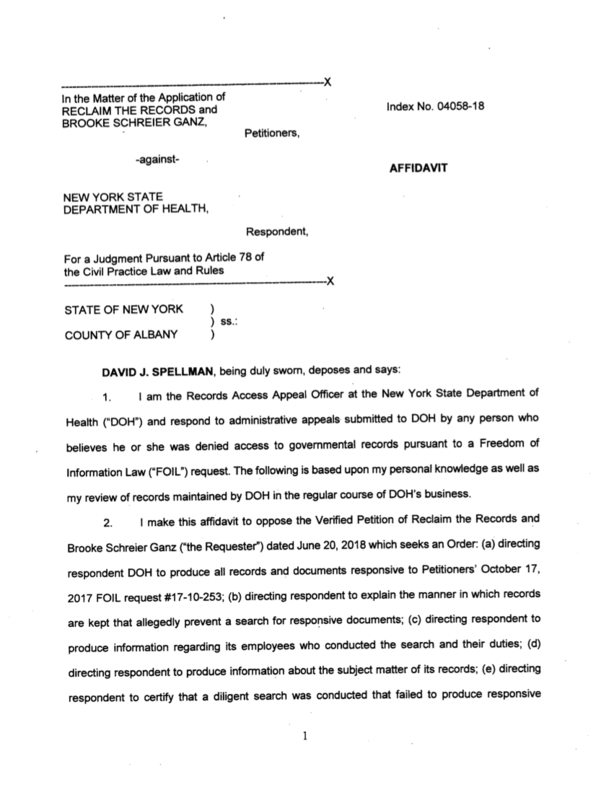 Under the New York State FOIL, we requested copies of all e-mails between NYS DOH employees and Ancestry to explain this apparent discrepancy in treatment. We’re also looking into whether or not the state violated their own laws about vendors and bidding. If Ancestry acted as a de-facto vendor for the digitization of these government files, the state (by their own admission in e-mails to Reclaim The Records) should have gone through a competitive bidding process. The DOH refused to provide the vast majority of the requested documents. Then they refused to reply to our legal FOIL Appeal at all, although they were legally required to do so. 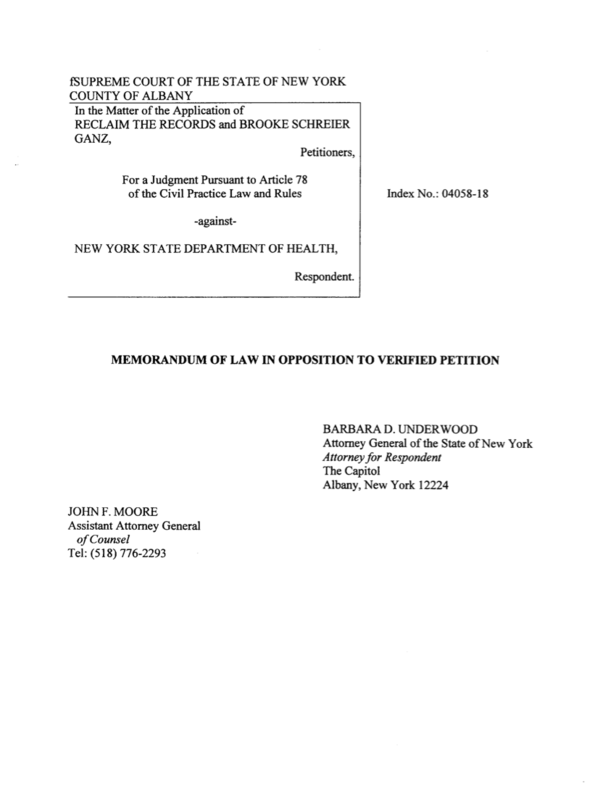 So, we sued the NYS DOH. The case is currently pending in the Supreme Court of New York, Albany county. Read more about this case in our e-mail newsletter from July 4, 2018. 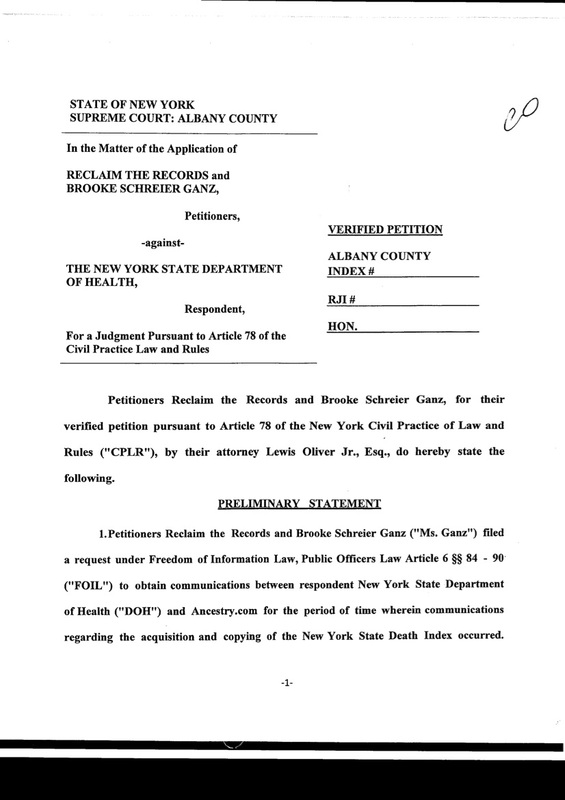 Here's the text of our Freedom of Information Law (FOIL) suit -- more properly known as an Article 78 petition -- filed in the Supreme Court of New York, Albany County.